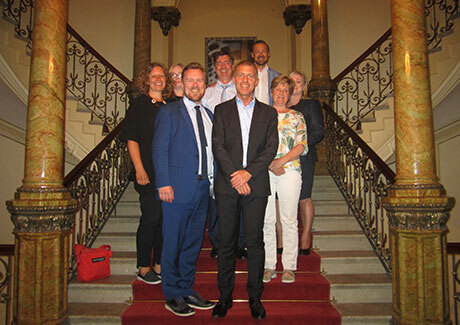 Michael Pedersen spoke at a network meeting for Finnish government, business and civil society leaders. The half-day meeting took place in Helsinki, Finland on 13 June 2018. 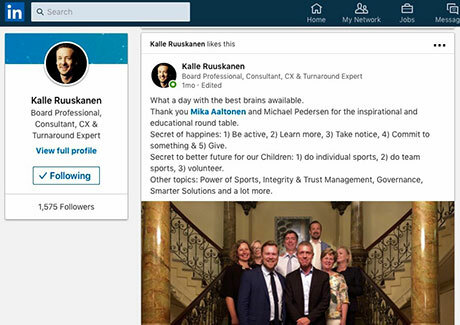 It was organized by Mika Aaltonen, Research Director at Finnish Consulting Group (FCG); former CEO of Helsinki Sustainability Center; and former professional football player on the Finnish national football team. In what was a highly engaging and interactive network meeting, Michael particularly shared perspectives related to governance, transparency, ethics, integrity and values – in business as well as in sport. He also shared leadership insights from his personal and professional journey, including his volunteer work with disadvantaged children and youth around the world with sport as the enabling tool. Last but not least, Michael offered a hands-on peer-to-peer experience through the facilitation of a fair play game. The game, developed by behavioural economists, provided a fun basis for network members to discuss what fair play actually means in practice and what it feels like to be treated unfairly. FCG is a multi-expertise company that provides services in infrastructure, environmental and urban design, in multidisciplinary training and in developing public services. The company’s clients represent a broad range of private and public sector organisations in numerous countries around the world.